Polly Pride is on the case! With a new mysterious cosmetic factory opening in town, PJ the Pet Detective is on the ready when the town's pets go missing. Everyone assumes the worst and it's PJ's job to right the wrongs and get the pets back to their frantic owners. 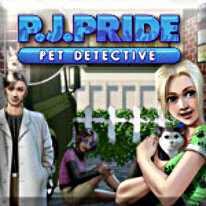 Hidden object mayhem keeps the pets out of plain sight as you join PJ in her detective work. Look carefully through 96 unique scenes jam-packed with the wildest objects. You never know where one of the 90 missing pets may have found a new home! Unlock the town's stores, homes, and even a tattoo parlor in 20 levels of snooping. Realistic sound effects, a captivating story, and beautiful illustrations are sure to keep any gumshoe on the case!